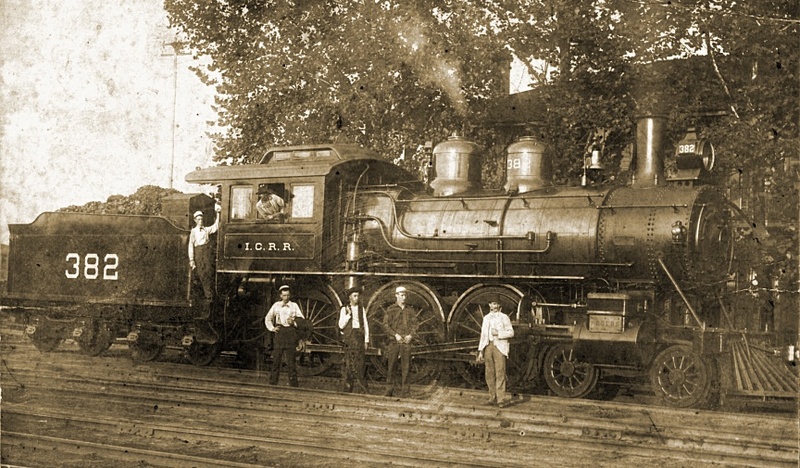 John Luther "Casey" Jones got his initial railroad experience as cub operator on the M & O Railroad at Columbus, Kentucky. A few months later he transferred into more active railroading as a brakeman on the line between Columbus and Jackson, Tennessee. With his long range goal of becoming an engineer in mind, Casey made another transfer; this time becoming a fireman on the M & O line between Jackson, Tennessee and Mobile, Alabama. Finally in March, 1888 he made his final move, which was to change railroads. He moved this time to the Illinois Central as fireman on the Water Valley, Mississippi and Jackson, Tennessee Districts with his seniority board at Water Valley. Opportunities for advancement looked good on the ICRR and Casey's seniority rights as fireman and later as engineer were on all road and yard jobs from Jackson to Canton, Mississippi. In addition, there were several blanket passenger runs from Memphis to Canton manned on alternate trips by Water Valley crews. Casey had seniority rights on these runs also. Old records of the Brotherhood of Locomotive Firemen's lodge, Water Lily 402, show Casey joining the Water Valley lodge on July 21, 1890. He was promoted to engineer on February 23, 1891 and his name first appears on the register book of the Brotherhood of Locomotive Engineers lodge at Water Valley on March 10, 1891. This maintaining membership in both of the enginemen's labor organizations shows that he strongly supported the principles of collective bargaining advanced by the young rail labor movement. It also shows Casey's concern for his family's security, for one of the benefits of brotherhood membership was life insurance protection. Mrs. Jones collected from both groups when he died. As was the lot of newly promoted engineers Casey worked in extra road and yard service until he could hold a regular engine. In those early steam days an engineer bid in assignments on engines operating on a specified district rather than on a particular run as in later years. He stayed with his engine wherever it went. In the summer of 1893 the Chicago World's Fair was attracting huge crowds to the grounds along the lake on Chicago's south side. This was ICRR territory and the line was being taxed to provide transportation for the thousands coming to the fair. A call was sent over the system for engineers. Casey responded and spent the summer of 1893 in suburban service in Chicago. It was here that he became acquainted with No. 638. The Illinois Central had this big new freight engine on display at the fair. At the closing of the fair the 638 was due to be sent to Water Valley for service on the Jackson District. When this knowledge came to him, Casey asked for permission to run the engine back to Water Valley. His request was approved, and the No. 638 ran its first 589 miles with Casey Jones at the throttle all the way to Water Valley. Casey was soon able to bid in the No. 638 during periods of heavy business as older engineers bid in engines on preferred runs. Casey liked the No. 638 and especially he liked working on the Jackson District because his family was in Jackson. They had once moved to Water Valley but Jackson was really home to the Jones family and when Casey got back to the Jackson District they moved back home. Casey and John Wesley McKinnie had this photograph made by Water Valley photographer J. E. France. So it was that Casey and the 638 spent more and more time together until in the late 1890's he had seniority to hold this fine little engine altogether. His regular fireman on the No. 638 was a young friend, John Wesley McKinnie, and from about 1897 until Casey went to the passenger run out of Memphis these three were inseparable. Over the years Casey had his share of extra passenger runs and he liked the work and the pay. Generally, passenger runs offered a much shorter working day, better pay and considerable prestige; all of which appealed to the young engineer. His first opportunity at a regular passenger job now came open to him. In February 1900, W. W. "Bill" Hatfield transferred from Memphis back to a run out of Water Valley thus opening up trains No. 1 and No. 4 to a younger engineer. It would mean moving his family to Memphis and it would also mean separation from McKinnie and No. 638. But, Casey saw the move as a good one and bid the job. Now, after ten years as engineer, Casey had a regular "high wheel" job. Instead of dodging passenger trains by running in and out of sidings, as he had done in freight service, he was first class. The four big ones, passengers No. 1, No. 2. No. 3 and No. 4, bowed to each other (took siding) on the superiority of direction but for no other trains did they "go in the hole." The new job went well. Casey was pleased with the 300 class passenger engines that were assigned to the run. He missed McKinnie but had a good young fireman, Sim Webb, who had been firing the job with Hatfield. Most pleasing was the fact that the job was a challenge to his ability as an engineer. The Illinois Central had been regularly shortening the running time of its passenger trains between Chicago and New Orleans so that an on time run was at a pretty good pace; a late run a real test of the engineer. The time card schedule on trains No. 1 and No. 4 allowed about five hours time from Memphis' Poplar Street Station to Canton and about the same time back north. With his 300 and seven or eight cars this was a mighty light day's work. As the consist got heavier and the train later, the task became more demanding, but all the officials really demanded of an engineer was that he make running time. In other words, that he deliver the train to the next division no later on the schedule than he got it. Passenger comfort was not too important and damage suits, for being thrown about at high rates of speed, almost unheard of, so dispatchers and other officials looked the other way when too much time was made up. Casey did his best to give them their money's worth - most often more! A good engine, a good fireman, a light train and away late; the perfect setting for a record run. He made that record run too, if the oft quoted departure time of 12:50 is correct, for Casey went to Goodman on time for a meet with No. 2 and Goodman is twenty miles north of Canton. The late Bruce Gurner, railroad historian, told the story this way and asked that you imagine we are with Casey on that last run. Gurner had made the trip during his career with the ICRR and knew the route. "As we move out of Memphis and through the yard Casey could gain a few minutes time for there was a little padding to take care of normal yard delays. Once he passed the switch at East Junction, Sim had better be ready because it was uphill and fast for several miles. There were slow curves at intervals until he topped Hernando hill, twenty one miles out and then hold on to your hat for it was down the hill through Love Station and across Coldwater River bottom as the telegraph poles began to look like a picket fence. One more slow curve south of Coldwater and then the Grenada District racetrack for sixteen miles with only a gentle curve at Senatobia and another at Como. As Casey passed through Senatobia his thoughts were with Dave Dowling and his fireman Jack Barnett. They had roared through the same way last November and turned over at the south crossing, killing both of them. Funny thing, Casey reflected, how the newspaper account headlined the story "Mail Train Delayed by Accident." At some length it was explained that due to a wreck of the down train on Monday morning, the mail was late and several local citizens who were returning from visits to Memphis were quite late getting home. 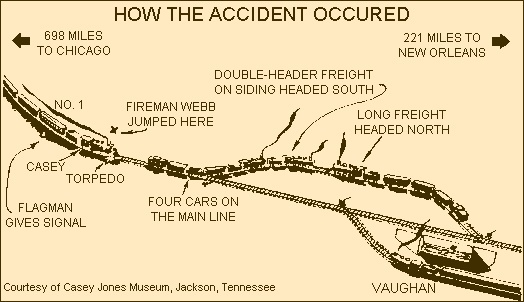 The last sentence briefly stated, "Both the engineer and fireman of the train were killed instantly in the overturning of the giant locomotive." No names were given! A fellow sure deserved to get his name in the paper for that day's work, Casey must have thought. Engineers will never get to be famous with that kind of publicity. A quick water stop at Sardis. Fifty miles out and Casey noted with satisfaction that he had picked up more time than he hoped. From here to Grenada would be slower, but he could steal a little on the curves and let her ramble across the creek and river bottoms and make up some more time. It worked just as he planned it and he really let No. 382 go from the top of Hardy Hill to Memphis Junction, one mile from Grenada. Too fast around that curve at Hardy; pity that poor baggage man; he would have to stack it all up again. If he ever became superintendent, mused Casey, as he stopped for Sim to line the switch at Memphis Junction, he was going to see that this switch was lined for the Grenada district instead of the Water Valley district. He had run through it one morning about two weeks before and his ears were still burning from the comments of Trainmaster Bill Murphy. When he stopped for water at the penstock at Grenada, Casey was only about forty minutes late, and a hundred miles out. That light train sure made a difference. A fellow had to ease off on this No. 382 to keep from going through the curves too fast on top of the hills as well as the bottom. They might call him in about coming to Grenada too fast, so he had better drift some south of Grenada. The track was fast from Grenada to Eckridge, some curves up the hill to Sawyer, then a brief stop at Winona. From Winona to Durant he was looking at thirty miles of speedway and no restricted curves. He would see eighty through the creek bottom just south of Magee siding, if he wasn't badly fooled, and that was fast for the light rail he was on. No strain on the 382 though! By the time he had headed out of the passing track at Goodman Casey was five minutes late but going to Canton on time would be a simple matter if all went well. Experience told him there was congestion somewhere ahead for there were several freights he normally passed and met that were not accounted for. He had no orders on northbound local passenger No. 26 so they would be clearing him somewhere on the time card schedule. If there was a saw-by waiting for him it must be working because No. 2 was about on time. Things were looking good and that bed in Canton would feel good too. He was getting tired. Went in on No. 4, his regular job, last night expecting to get a good night's sleep but they had called him to double out on No. 1; Sam Tate was off and no qualified man available. Casey was by Pickens now and almost on time. No trains here in the passing track; they all must be at Vaughan six miles ahead." While Casey was rolling south, the stage was being set for his tragic wreck. Southbound freight No. 83 had arrived at Vaughan and while pulling into the passing track had pulled out two drawbars. Southbound passenger No. 25 was thus delayed some minutes. Northbound freight No. 72 delayed at Way by No. 25 could go no further than Vaughan for northbound passenger No. 2. With freights No. 72 and No. 83 both in the passing track there were more cars than the track would hold so it was necessary for these trains to move north or south to clear the main line switches in order to allow other trains to pass; this is known as a sawby. Meanwhile, two sections of northbound local passenger No. 26 arrived from Canton and had to be sawed in on the house track on the west side of the main line. As No. 83 and No. 72 hurried to saw back south to clear the north passing track switch for Casey, an air hose broke on the fourth car behind the engine on No. 72 and it could not move. No. 83 was blocked by No. 72 and he couldn't move either. Several cars of No. 83's train were still out on the main line above the north switch. Fireman Kennedy on No. 72 was closest to the broken hose so he rushed back to change it. Before he could get the hose on, the crash came. The No. 382 smashed into the caboose and several cars, lunged crazily to the left and came to rest on the engineer's side pointing back from whence she came. Casey was mortally wounded by a bolt or piece of splintered lumber having struck him in the throat (information available later has shown that eyewitnesses reported that a metal bolt struck Casey in the neck). A stretcher was brought from the baggage car on No. 1 and crewmen of the other trains carried him the one-half mile to the depot. Here, lying on a baggage wagon, Casey died. What went wrong? Sim Webb says he saw the flagman and heard torpedoes. Crews on the other train said they heard torpedoes. Many have said Casey was "short flagged" but John Newberry was an experienced man and he had flagged No. 25 a short time before. The railboard's formal investigation concluded that "Engineer Jones was solely responsible for the accident as consequence of not having properly responded to flag signals." The implication being that Casey got a saw-by sign from Newberry and assumed the north switch would have been cleared for him. He made a brake application and was slowing when Sim saw the caboose and shouted. The emergency application was not enough, but it slowed the train enough that no passenger or other crew member was seriously injured. Why didn't Casey jump? That is really the hard one to answer. Once the engineer puts the brake in emergency, reverses the engine and opens the sanders, the engine has no further need of his services. It is up to air and steel to stop the train. You would just have to understand how Casey loved his job, his engine and the railroad to understand why he did not jump. There might be one chance in a million that he could do something else; he wanted to be there to do it. They switched out enough cars of the two No. 26's to make up a train, transferred No. 1’s passengers and sent them on south. Casey's body was taken to Canton in the baggage car. Next morning he made the long trip back home to Jackson, Tennessee on passenger No. 26. On the following day the funeral service was held in St. Mary’s Church where he and Janie Brady had married fourteen years before. Burial was in Mt. Calvary's Cemetery. The newspaper account lists the names of fifteen enginemen from Water Valley who were there to pay their last respects. This was something of a record too. Fifteen men laying off to honor a friend by riding 118 miles to his funeral. If we did not already know that Casey was not the rounder the song would have you believe, we know it now.